WHEN IS THE NEXT FREE SPAY DAY OF PAWS? WHY CAN'T PAWS PROVIDE FREE SPAY/NEUTER IN MORE AREAS? 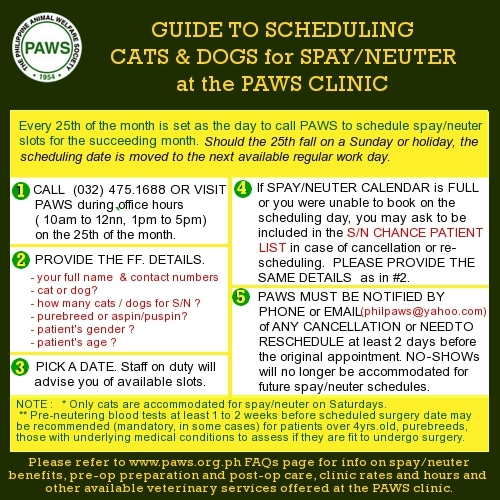 PAWS announces free spay/neuter days accordingly for registered indigent pet owners, however, we cannot offer it all the time because of lack of funds. Remember, we are not funded by the government and rely on our volunteers and kind-hearted individuals for donations. 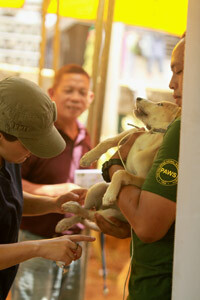 PAWS also offers low-cost spay/neuter all year round in the PAWS Clinic in QC. PAWS allows installment payments for those on a budget, this may be discussed when making the appointment. There are many (even those without their own vehicles) who bring their pets to PAWS even if they come from far areas such as Bulacan, Las Pinas, Cavite, Laguna just so they can avail of PAWS' low-cost rates. 1. Inquire with their LGU (local gov't unit). 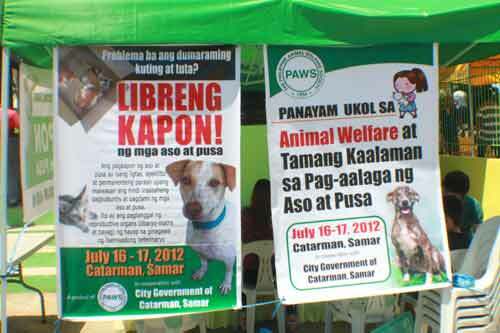 Some LGUs already offer free spay/neuter and vaccination days. 2. Pet owners can also appeal to their regular vet (the vet they bring their pets to for yearly check-ups and vaccinations) if they can be given a discount or allowed to pay through installment - in our experience, vets can extend this to their suki clients. 3. Have your female pets spayed first to prevent them from giving birth to a number of puppies/kittens. When there is enough budget again, have the males neutered. 4. Start a SPAY/NEUTER (KAPON) FUND - leave out a piggy bank by your door or entrance. Invite family members and visitors to leave their loose change or contribute to help your pets get spayed/neutered. In this way, you are also helping to educate and create awareness about spay/neuter. PAWS also offers free seminars about humane education, responsible pet ownership, TNR, etc. to interested LGUs. We are willing to help LGUs in the province as well, all they have to do is contact PAWS and subsidize transpo for our volunteers to get there. 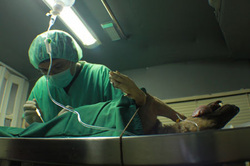 Dr Alice Utlang, Cebu City Veterinarian, has a Spay/Neuter Program with HSI there. Their Animal Birth Control Center is located at "the back of sm and basak at swu cvm hospital" (per SMS message of doc alice). Tel 032-3162296. She can help you have your dogs spayed or neutered to prevent unwanted pups. Can PAWS conduct a SPAY/NEUTER and HUMANE EDUCATION OUTREACH PROGRAM in our location? /Sana magkaroon din ng Libreng Kapon sa probinsya/barangay namin. For those requesting Spay/Neuter and Humane Education Outreach in their areas, please bring this up with your Local Government Unit (LGU)/Municipal or City Government or Barangay. 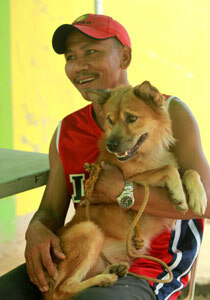 Some LGUs already offer free spay/neuter in their Municipal or City Veterinary Office. Some City Vet Offices are able to perform the procedure (for free or at low-cost) for as long as the pet owner can shoulder the cost of the medical supplies or drugs/anaesthetics needed. For every Spay/Neuter outreach, PAWS sacrifices its shelter & clinic operations because there will be no shelter vet, will lack shelter manpower by giving up handlers & key volunteers for the duration of the mission. This is why the Spay/Neuter trip has to be scheduled way ahead of time so that it does not affect treatment regimen of the shelter animals undergoing rehabilitation & pet owners who avail of low cost veterinary services may be advised of the dates the clinic will temporarily close.